If you want to know anything about herbs, native and domestic flowers, Durham Herb Fair is the place to visit. The event is held on the second Saturday in June each year. Browsing the Fairs' booths can be addictive. Browsing is not the correct word to use. We sniff, taste, touch, ask a lot of questions and buy. We sing along to the catchy music emanating from the Entertainment Area. There's usually a good line-up of performers and at least one sings that old favourite English tune, Scarborough Fair. The song is appropriate. You can't help but sing about herbs while passing tables full of parsley, sage, rosemary and thyme. We are not referring to the Region of Durham, east of Toronto. Riverside Park is in the small town of Durham located in Grey County a little south of Owen Sound on Highway #6. The town is well known for Welbeck Saw Mill & Hardware Store, the annual August Wood Show, a September Autumn Leaves Studio Tour and their popular, well-attended June Herb Fair. A pleasant early morning drive north on Highway #6, through bustling Arthur and Mount Forest reveals a few of the more unique aspects of life in rural Ontario. Due to rapid urban expansion in the Kitchener/Waterloo area, a large number of Mennonites are moving to slower-paced north Wellington and Grey Counties, where farms can still be bought for a reasonable price. Driving the highway, we often experience the strange feeling of having stepping back in time as horse-pulled farm equipment appears out of pink-tinged morning mists. We often turn down signed farm lanes to buy home baking, jams, jellies, vegetables, meat and maple syrup. The sparkling Saugeen River, that runs through Durham, is part of the reason the area was settled in the 1850's. Durham was then located on what was known as the Garafraxa Road in the Queen's Bush. The Scots/Irish community stays true to its roots. It boasts Empire Meats, one of the best Scottish butcher shops in Ontario. Bring a cooler to take home some bridies, onion & mince pies and sausage rolls. Durham also is home to family-owned, award winning MacDonald's Bakery. Passersby are lured into the sparkling clean bakery with tempting smells and a window full of delicious treats. To be absolutely truthful, we always take to the road early so we don't run the risk of missing this bakery's mouth-watering Eccles Cakes. Riverside Park is located behind Durham Town Hall, several blocks from Garafraxa Street which is #6 highway. On Fair day, parking can get hectic so when you see a spot, pull in and walk to the event. Bring baskets to carry purchases back to your vehicle. The shady park is chock-a-block full of vendors and displays. It is an ideal location for a venue devoted to herbs, flowers, vegetables and crafts that are relevant to the theme. We chose from great displays of native wildflowers, cultivated garden plants, grasses and ferns, shrubs, rockery rootings, flowering vines, herbs and heirloom vegetables. Crafts people offer quality in-theme products that include functional baskets, hand-decorated pots, natural soaps, garden sculpture, bird houses, feeders and innovative flower containers. 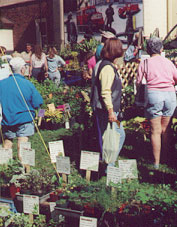 A number of the town's private gardens are open to the general public during the Fair. If garage sales are your forte, enterprising residents set up tables opposite the park and around town on Fair day. Herb-related booths are also set up inside the Town Hall where a reasonably-priced lunch of sandwiches, homemade pie and beverage is available, while quantities last. 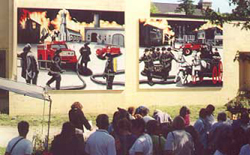 The hall's exterior back wall has an excellent mural that depicts firemen, past and present. 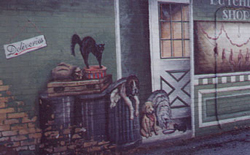 It, and other murals in the downtown area by renowned artist Alan Hilgendorf, are an intricate part of Durham's rural charm. 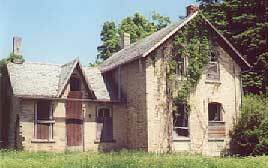 The town has a number of architectural and natural treasures. Townsfolk have turned a former railway bridge into a pedestrian walkway over the Saugeen River, that leads to the local Art Gallery, feed mill and mill pond. A walk along shaded streets lined with Victorian homes, always brings you back to the main shopping area, bustling Garafraxa Street at the foot of the Durham Hill. The hill was a daunting haul out of the village toward Chatsworth and Owen Sound during horse and buggy days. 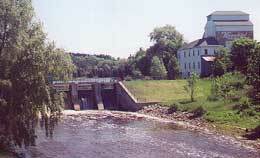 The river is bridged by three dams in town. One holds back the mill pond. A second one is several blocks away near the arena. The area is also known for its annual wood show, one of the most comprehensive in Ontario. For anyone interested in fine-woodworking and recreational wood-crafting, this is the show to attend. The Welbeck Woodcrafters Expo is held annually at the Welbeck Sawmill near the town of Durham, on the Friday and Saturday of the second weekend in August. While visiting Durham, plan a side trip to Welbeck Saw Mill & Hardware Store. Take Highway #6 up that steep hill and through the Upper Town. Approximately eleven kilometres north, watch for signs indicating that Welbeck Saw Mill is to your left. You'll turn onto a gravel road and travel approximately three kilometres before seeing the large hardware store on the left. The attraction is well-signed but watch carefully for its entrance. If you see the sawmill, you've gone too far. The store boasts 24,600 square feet on two floors. It advertises large collections of household items, toys, gardening equipment, hard-to-find craft and woodworking supplies. Their cabinetry and wood stove sections are must-sees, as is their selection of books geared to the handy person. There's enough diversity in this store to keep both men and women happy for several hours. Rather than return to Durham by the highway, we choose to take a leisurely drive home down gravel roads, navigating with a map from the Tourist Information Centre. It is amazing what can be found on these quiet by-ways. Prosperous farms rub shoulders with abandoned homesteads. Country churches stand alone amidst the remnants of crossroads communities. We gather asparagus and rhubarb from abandoned patches beside dusty ditches. Deer are often seen, grazing in fields and old orchards. On our travels, we've found gems like Wild Things Plant Farm in North Wellington bordering on Grey County. Wild Things holds special-interest weekends during the growing season but people can visit the plant nursery at any time during their open season. You can browse display gardens and stroll pretty woodland trails, cameras in hand to catch that perfect butterfly shot. What better place to hold an Herb Fair than in Grey County that has some of the prettiest rural landscape in Ontario. Take it from me, the area is well worth a visit. at the Empire Meats location.